Our house, built into a slope and on a rock seam, also lies within a medium-high radon risk area, according to PHE/UKradon. A while back, I applied to UKradon for a home testing kit, which comprised three dosimeters: one for each floor. When the results came back in from the laboratory, some of my fears were confirmed. Ideally, levels should be below 100 (Bq/m³), but not exceed 200. Zones (A) represent normal operation of the MVHR, and, overall, I am reasonably happy with the radon levels (for the first two (A) sections). However, (B) shows a period where we go away on holiday for two weeks, and the MVHR is set to intermittently ventilate at a lower speed (average 0.1ach). I was somewhat alarmed to see the levels reach almost 600 Bq/m³ when we returned! The house was quickly purged for several hours (windows/doors), and was relieved to see the radon levels return to ‘normal’. I also wished to check the effectiveness of the additional extract valve under the house, so, in December 2016, I blocked it over for approximately 4 months. The resulting increase in radon levels (measured in the adjacent kitchen/diner) is illustrated in area (C), and rise to around 280 Bq/m³ (i.e. returning to the levels found during the original PHE test). At the beginning of May 2017, the extract in the undercroft was uncovered, and the ventilation returned to its normal setting. It takes much longer to clear than I would have expected (getting on for six months), so the rate of extract is only just sufficient to deal with the decay rate that the radon is permeating into this space. 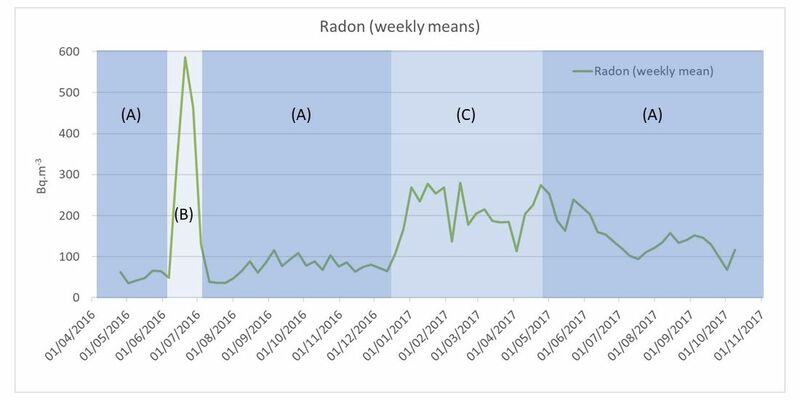 This post is to illustrate how ventilation can help to manage radon levels, but given the health risks associated with radon, I suggest you don’t play around (like I have! ), but deal with it. Partly, the point of this monitoring, and this post, is to question whether we should we rely on ventilation for radon control? I suggest we should deal with the source: source control followed with dilution through ventilation is the principle to adopt. It’s not a job I’m looking forward too, but my plan is to use something like Newton 102 Nuseal to seal the capping in the undercroft – but will this liquid membrane introduce new chemicals into the home…? I’m happy to hear from you if you have any other ideas. I believe that, coincidentally, the water table has risen in our area during the same time as this monitoring (I have noticed the capping in the undercroft is, in some areas, getting slightly damp). This is normal (particularly living on a slope), but the increasing hydro-static pressure underneath the house is likely to push out radon too(?). So, the radon levels illustrated, whilst clearly influenced by the ventilation rates, may be insufficient to control radon at times when the emission rate is higher. This is a case study, and it may not be representative. This post is intended as a discussion piece, not a guide for dealing with radon. Visit the PHE/UKradon website for further information on radon, home testing, and prevention measures. This post assumes external radon. Radon can also be present in aggregates used in construction materials. A balanced MVHR may be appropriate for such a scenario, but the evidence is not available (to my knowledge) at present. 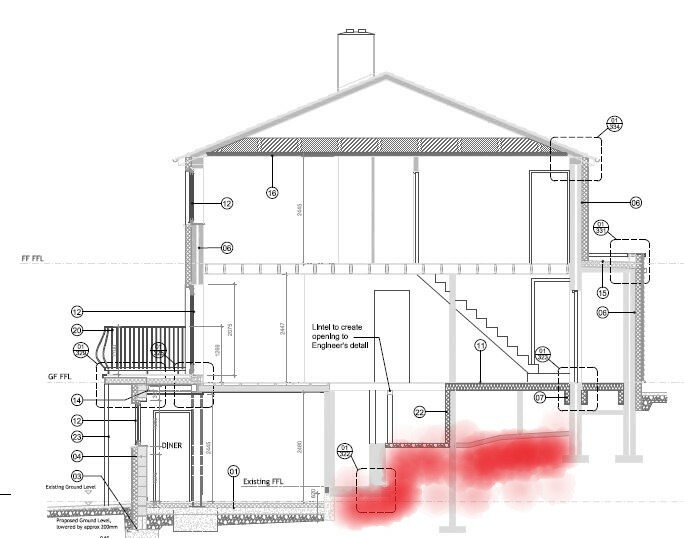 This entry was posted in Extension, Indoor Air Quality, Monitoring, Ventilation and tagged Airtightness, MVHR, Radon by Ian Mawditt. Bookmark the permalink.